Rockies bench coach Mike Redmond is drawing interest from two manager-needy teams, the Phillies and Tigers, Jon Heyman of FanRag reports. Redmond isn’t far removed from managing the Marlins, who went 155-207 on his watch from 2013-15. The former big league catcher played with the Marlins from 1998-2004, giving him familiarity with Tigers general manager Al Avila. The executive was in Miami’s front office for a portion of Redmond’s tenure as a player there. There haven’t been any contract discussions between the Rockies and outfielder Carlos Gonzalez since spring training, according to Mark Kiszla of the Denver Post. The Rockies offered CarGo an extension back then, but he turned it down and proceeded to endure the worst season of his career. The 31-year-old impending free agent batted an uncharacteristically poor .262/.339/.423 in 534 plate appearances, but he did fare much better after the All-Star break (.314/.390/.531 in 207 PAs). Dam right dipoto had a hand in shaping the d’backs he traded them half their roster when he was with the angels and the mariners. This rumor has to be a joke. …ask yourself is Redmond a step up from Mackanin? No way! ooops…I hit the up button by mistake. Managing the Marlins is like a paramedic working at the county morgue. His job is so futile that it’s impossible to measure on the basis of results if he’s good at what he’s doing or not. No manager is worth 15-24 wins. If they were, they would be getting 60 Million a year. It will be difficult to find a “step up” from Mackanin. He was an excellent manager. Now Indian fans can be treated to endless stories about how they missed out on Aaron Judge. It wasn’t until Judge broke out that Yankee fans could stop having to hear the story about how the Yankees missed out on Mike Trout. Nobody has any idea what a player is going to turn into when he is drafted in baseball so these what-if’s are so tiresome. That’s an odd belief. While scouting isn’t a an exact science team’s spend tens of millions of dollars every year trying to determine, or at least approximate, exactly that. If you are correct that there is no way of projecting what a player will become, teams would be better off making draft decisions by throwing a dart at a board and spending those tens of millions of dollars of scouting money on something more productive. Good scouting isn’t about just figuring out what kind of player they’ll be. You also talk to parents, friends, teachers, coaches, etc. about their makeup. What kind of student are they? How do they interact with people? What’s their work ethic? Important questions because it’s not just about how well you can play baseball, though a large portion of it is. Are they going to work? How do they react to negativity? are they a leader? You have to scout the player and the person. In fact, I think there is a reason for Judge’s mysterious breakout. I tie it to the likely “juiced baseball” that has been the primary driver of this year’s HR explosion. I suspect that Judge entered spring training aiming to square the ball up better by “taking something off” of his swing. In the past, doing that would have meant too many fly ball outs, and the hitter would have to work to find a balance (and said balance wouldn’t be nearly so impressive). However, Judge realized with his natural leverage and the way the juiced ball flew that he could take off quite a bit from his swing and still have ample HR power…enabling him to square the ball up far more often than he otherwise would be able to. I credit him for realizing this, but it wouldn’t be happening at all without the ball being the way it is. Has Rachel Maddow blamed the Russians for the juiced ball? It was Manfort and Flynn, on the Russian’s behalf. Manfort was in the Ukraine. Are baseballs manufactured in Ukraine? Flynn was by Trumps side throughout the campaign. Aren’t the balls manufactured in Haiti? You got a lot of pieces missing in your puzzle. Maybe Rachel should hire Alex Jones, he’s a lot better at this stuff. There are numerous well-researched articles published on reputable baseball sites all over the web about the changes in the ball, using actual data and testing. It’s not some conspiracy. (I’d link to the articles in question but don’t know if that’s allowed here; google is your friend). 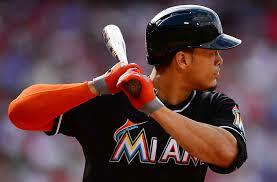 So, when he hits a weak pop up to 2B, does that mean the juice in that baseball has gone past it’s expiration date? Progression from pitchers being trained for two decades now that the radar gun is all that matters. Ultimately, hitters have evolved by working on timing. It’s become a homer friendly game, and it will continue to be until a few pitchers have success being actual pitchers again. Most pitchers don’t really “work in the zone” as we used to say. They use velocity to try to get hitters to time their fastball so they won’t have time to adjust to a breaking pitch outside or in the dirt, and conversely they’re basically teaching hitters to guess fastball. I’ve never seen so many hitters TAKE mid-80s hung breaking pitches because they’re that zeroed in on fastballs. The game is always changing. The pitchers were ahead of hitters for a few years, so far ahead that people wanted to plow over the mound to (literally) level the playing field. Hitters adjusted, and we’re seeing loads of HRs as they’ve started to figure out how pitchers were beating them. Yes, but how did Putin and his henchmen alter the ball? Judge is hitting the ball further than anyone, and it’s obviously not even really close. He’d have most of his homers regardless of the juiced ball. This isn’t Brian Dozier here, who is the king of the “just barely” home run. Crtainly the changes in the ball help, but Judge’s approach at the plate – patience coupled with a quick swing and massive strength – are going to produce a lot of home runs regardless of the ball. If even the Yankees thought he’d have been that good they would’ve grabbed him earlier and not waited until the compensatory picks. Maybe the chip on the shoulder for being picked behind 31 others as well as his tutelage in the minors shaped him more than had he been picked earlier and elsewhere. Judge has done better in the majors than he did in the minors. I think most teams stayed away from Judge because there has literally never been a hitter his size in baseball history. Sexson was probably the closest and he was a very different body type. Teams still have biases against very tall and very short players, and some of those are well-founded (you wouldn’t want a huge catcher or a tiny first baseman) but the success of Judge and Altuve may well help break some teams out of that box. Never? Ever hear of Frank Howard or Tony Clark? I could think of a couple more. IMHO Judge got severe cases of the “yips” in the minors. So far his MLB career has mirrored what he did in the minors exactly. Whenever he was promoted to the next level of the minors (A to AA, and AA to AAA especially) he had a bad first year. The following year he would hit very well and would advance to the next level only to have the same scenario repeat itself. Not all players are gifted with the poise of Mike Trout. Fortunately for Yankee fans Judge has settled in nicely and will only get more comfortable in the majors the next couple of years. Hopefully, he will be able to work on the k’s.. With his size and massive strike zone he will probably always be a K machine though..
That happens to the majority of minor leaguers that eventually make it to the bigs… Not many guys jump a bunch of levels and start raking everywhere they go. But he didn’t light it up anywhere like he has in the majors. Typical Red Sox fan post. Jealous? Is that why Mookie has suddenly found POWER also? Another know nothing Red Sox fan jealous and envious that the Yankees have Judge and Judge is a stud. Deal with it Red Sox Nation! I think Judge will fall as fast as he rose next year, Clevland showed how bad a hittier he is and he will go back to hitting 220 next year. He may hit a few homer against number 4 and 5 pitcher next year. Yeah, it’s all the juiced ball. That is why you see security quickly running into the stands and ripping every home run and foul ball away from fans. They can’t let it get out that they have a secret deal with JPL to install miniature jet engines into the balls used to pitch to Judge, Stanton, Trout and a few others.. It is a well known fact that a 6’8″ 280lb athlete couldn’t hit a baseball out of the infield without the ball being doctored somehow.. Anyone remember 1987, or read about it? Did dozens of players use PED’s, only to stop at once the following year; or was the ball juiced? A huge amount of players suddenly hit for pretty good power and established career highs.. This year, I’d the ball is juiced or PED testing isn’t working. Not that MLB wants to do anything about PED’s in the game if they don’t have to! If there are new drugs, undetectable by the current testing methods, I’m pretty sure that is perfectly fine with MLB.